The colourful chunky wooden pieces can sorted into their corresponding cut-outs on the wooden tray. 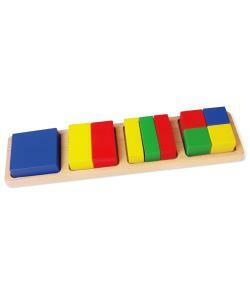 Suitable from 12 months plus, this finely crafted wooden set encourages early maths and dexterity skills. 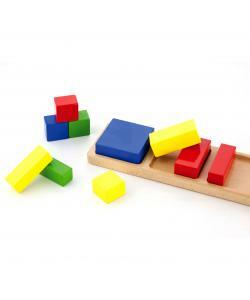 Bright primary colours and 4 different shaped blocks help build early identification skills. 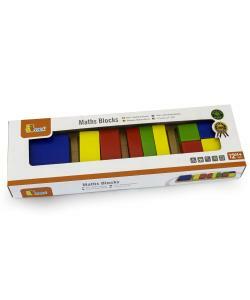 The Viga First Maths Blocks Set is the perfect first blocks set for a child. Each finely crafted and painted block has smooth edges and bright primary colours to help young children engage quickly and encourage learning by play. Whilst this set helps children to learn early maths skills, it also provides imaginative play as children stack the blocks.